First off I would like to apologize to any of you who may be offended by my story. I understand that to some, the topic of cloning is one that is very sensitive and is a process best left in the hands of God. Be that as it may, this story may soon come to light in a most public and overblown manner so I wanted to let my friends and family in on the tale before the potential media frenzy begins. To put things simply, I have created a clone. Not some Dolly-the-sheep or imaginary friend but a living, breathing, very authentic duplicate of myself. The obvious questions are why and how, and I will address those but I think that an introduction is in order first. My clone’s name is Jaytoo – actually it started as J2 but that designation is so dry and clinical and is in no way appropriate for the being that I created. He was “born” just over four years ago in the spring of 2006. Being born for a clone is somewhat different than the traditional bursting forth from the birth canal and then crying at the top of your newly-discovered lungs. For a clone, it is more about becoming slowly aware of your surroundings. Oddly, even though Jaytoo was not restricted by the size and shape of a mother’s womb, he still remained curled into the fetal position until his infant body had matured. You always see that in movies with fetuses in jars or suspended in weird tanks; it’s inevitable that they’re hunched up into a bean shape. It’s a little surreal to know for certain that idiosyncrasy is actually a fact and not just some contrivance of Sci-Fi movies. As I watched him early on the morning of Saturday, April the 22nd, he slowly began to stretch and test the limits of his environment. At first he extended his left arm and when it met with no resistance, he did the same with the right. Fascinated, I moved closer and it was then, that I could see that his eyes were both open. The mere slits were barely wider than the breadth of one of his wispy eyelashes but there was almost a light emanating from the fierce black pupils. I continued to watch Jaytoo, enraptured as this new life slowly became self aware. Each year since, we have celebrated his birthday on that date. Again I would like to apologize to those of you who feel that this is blasphemy in the extreme. As I type, this whole story begins to sound so fantastic and unbelievable that I hardly believe it’s real – an unfortunate side-effect of having majored in English with a creative writing minor. At any rate, now that you know who we are discussing, that leads us back to the question of why. Why would anyone want to create a clone? Well, for me there were a number of reasons. Some heartfelt, others selfish, and most of them considerably foolish. I guess the main reason was loneliness. I had been unemployed for a while. Things hadn’t worked out so well at the place where I had sold Internet service for nearly five years so I had considerable time at home alone while my wife was at work. I spent hours surfing the web and watching television. It was then that I saw several of episode of Stargate SG-1 that really made me start thinking about the viability of cloning. Thor, one of the aliens that is always helping out SG-1 was waiting to have his consciousness downloaded into a new body; Fifth, the replicator created a clone of Major Samantha Carter; and then a young Jack O’Neill showed up and turned out to be a not-fully-matured clone of the Colonel. It was like a cosmic key had unlocked something in my brain and I couldn’t stop thinking about clones. Here’s a short side story to try and convey the enormity of how this felt. Not too long ago I watched a movie called Ink that my wife highly recommended. Yes, I watch too much TV. Anyway, in the movie there was a character called a Pathfinder who had some nebulous special ability that they didn’t reveal until almost the very end. Basically he could find the butterflies in the Midwest that could cause a typhoon in Southeast Asia. He could see the pattern in those very small seemingly random events that were the tumblers in the lock to world-changing events. I didn’t feel any smarter. I didn’t feel like I was trying to replace God. I just felt like I was in the exact moment – the ONLY moment, when the key to unlocking one of the most profound doors in the universe was in my hands. I don’t know to this day, and maybe I never will, if turning that key was one of the greatest advances for humankind or if I’m a reincarnation of Pandora and should have left it closed. For better or for worse, I stepped through. The how was a bit more complicated than the why but again something in the cosmos seemed to be putting the pieces into place long ago. I remembered all of the talk about Dolly and explanations as to how she was cloned from a sterile egg and donor DNA. Even though I had not finished my chemical engineering degree the first time I attended college, anything to do with chemistry on any level still peaked my interests – and that story was a whopper, so a lot of the details must have been filed away in my brain for later reference. This gave me a general frame of reference for the cloning process but you’re probably asking how could I have ever found the capital and lab equipment to have made this happen. Well, it just so happens that the number one engineering college in the country is ten minutes away from my house, and the year that I spent there didn’t give me a degree but it did give me a wealth of knowledge about how to get around the school, and when and how I could do research and experiments in the labs without raising eyebrows. To further add to the cosmic tumbler theory, I come from a large farm family with a lot of livestock. Honestly, harvesting the warm ovaries of a freshly-slaughtered animal to look for viable eggs is one experience that I truly wish I could forget. I settled into the routine of searching for a job a couple of hours every morning and then conducting Internet research or clandestine experiments at the college. My wife went to work and then came home to life as usual – oblivious to the real changes that were going on. I usually annoyed her by recounting the latest episode of Stargate over dinner or telling her about the jobs I had applied for and slowly we began to grow apart. I could not tell her about the obsession that I had developed for creating a clone. When I was spending time with her the thought of what I was trying to create seemed like a tortured dream – something just outside the reach of reality like the pages in a book. I could actually feel sympathy for Doctor Frankenstein and understood the overwhelming impetus behind his actions. While I know that’s only a book, the feelings and emotions his character evoked felt as real as those from any human interaction. The job search at this point was becoming tedious, our financial situation was becoming dire and I was at a point in my research and experimentation where I needed something to contain the clone long-term as it developed. Click, another tumbler. I was hired to sell water softeners. While the financial gains from that short-lived gig were meager at best, the contribution to my cloning project was immeasurable. Water softeners and other water treatment containers were the perfect solution to hold the fertilized embryo in a nutrient-rich suspension. I not only had access to a number of different options for the tank but to various filtration systems and pipes. It didn’t take long for me to scavenge the parts to create a workable environment to substitute for a mother’s womb. And again as fate would have it, I had just completed the set up in our basement when that job became untenable. 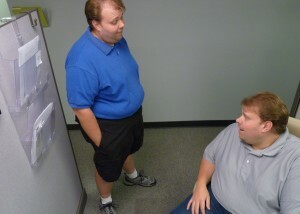 I began my cloning project in earnest. One of my concerns was with the amount of time that it would take for my clone to mature. I knew there was a very good chance that I would not realistically be able to take care of an infant for an extended period. In working to finish my English degree, one of the books that I had recently studied was My Year of Meats. The book spends a lot of time talking about the hormone DES that was given to cattle with the intention of increasing their productivity and how it had some side-effects for women that were exposed to it through experimentation as a fertility drug. I had to write a paper on the book which meant doing some background research on hormones which lead me to information on the human growth hormone produced in our pituitary glands and there I found the key to accelerate growth. As I explained earlier, Jaytoo was born on April 22nd however, the fertilized embryo was placed in the suspension on April 2nd only three weeks earlier. The process that naturally takes 9 months was cut to a mere fraction of that by the introduction of the hormone cocktail in the makeshift embryonic fluid. By continuing to lace his diet with the hormones, Jaytoo’s development was amazingly rapid. There was a two to three week period where I was almost sure my wife was going to discover this amazing secret hidden away in our basement as I weened him through infancy and into childhood. Within two months, Jaytoo stood on the verge of adolescence and I felt comfortable discontinuing the growth hormone treatments. Timing was one more fortuitous because employment again came calling. I landed another outside sales job, this time selling copiers and IT solutions so the position was a good fit for my technology compulsions. The flexibility of the schedule provided some latitude for me not only to finally complete my degree but to do things for Jaytoo who was of necessity confined to the basement. I felt some twinge of guilt for the forced confinement so I took to the habit of taking pictures frequently with my HP iPAQ to share with him. As many of my friends and co-workers know, that habit proliferated over the past couple of years and now everyone just thinks I like taking photos but until now they have had no clue about the cathartic need behind the pictures. Which brings us to why I am disclosing this story to all of you today. Without the additional hormone treatments, Jaytoo’s rapid aging slowed but not to a normal rate. He appeared to be aging not quite a year every calendar month. At any rate, we have reached a point where we are virtually carbon copies of each other. Admittedly I have more ear hair and one hereditary eyebrow that never stops growing, but I think he’ll probably have those in the next couple of months. I also love The Lord of the Rings and Harry Potter and he can’t stand either of them which disturbs me immensely. For his education, Jaytoo has been largely self-taught. I have kept every text book I ever purchased and in the long hours while my wife and I were at work, he was in my home office losing himself in classic literature and exploring the world through the Internet. Not long ago, we had a very long, serious discussion about his living circumstances. The experience gave me a whole new perspective on the phrase, having a heart-to-heart with yourself. As I had grown closer to Jaytoo, I had grown more and more distant with my wife. When she would want to go out and do something, I would make an excuse to stay home and spend time with him. I knew that he was lonely and felt an enormous burden of guilt that he had never been out and experienced the world. Jaytoo and I agreed it was time for him to dip his toe into life outside the house and we began to take some small chances. Thursdays became “boys’ night” so to speak. I took him out and taught him how to drive and soon he was going to the local pizza place to get our favorite. One of my close friends from high school works there part-time and sees him almost every time he goes in. I seriously about had a heart attack the first time he told me about running into her there. Since she’s working, they never seem to get into conversations over his head so it’s become our inside joke. At any rate, my marriage continued to falter and not long ago my wife decided to move out. I’m not sure what switch that threw in my head but Jaytoo and I began taking much bigger risks. Everybody who knows me knows that I do not have a twin and explaining away our appearance in public together would be no small feat if we ran into somebody who knew me that well. I just didn’t seem to care if I was being reckless anymore and Jaytoo either didn’t know any better or was too tired of being stuck in the basement to care. Friday on my way to the office, I dropped Jaytoo off downtown to spend the day at GenCon. I figured if I couldn’t be there, he may as well enjoy himself. The plan was for him to take a taxi and meet me back at my office around 6PM after everybody else was gone for the day. The plan worked fine except for the everybody else was gone part. He gave me a call to let me know that the taxi had dropped him off out behind the office, so I went and let him in through the security door. I still had a couple of things to finish up and we talked for a few minutes about some of the more colorful things he had seen. On the way home, I received a text from one of my co-workers with a photo of Jaytoo and I talking that had been taken over the wall of my cubicle. Apparently we were not alone and our secret had been blown. I know the co-worker well enough to know that the photo will quickly find its way to the media and my life will become a circus. I don’t know what will happen to us. I know there will be huge moral and religious debates that will rage over Jaytoo and I like waves over pebbles on the shore. Any hope of fixing my marriage will be swept to sea and lost. The tides will separate Jaytoo and I all that will be left on the shore is a solitary sea gull that will take up the lonely cry of someone with no friends, no children and no mate.